So good to get to know you, and your hair a little bit better. I love your hair. You may call it “Mother Earth” hair, but I think you also may be a member of the Wurly Sisterhood! You have lovely hair, it’s straight and curly at the same time. The best of both worlds! Oh! I used to have the same short and spiky ‘do, except the bang pieces I kept layered with the longest going to about my cheekbone. It was my favorite style to date. Loved reading about your hair care. You have such gorgeous locks! I envy the waves. Mine is so poker straight and won’t to a single thing otherwise. You have beautiful hair! Your tale of cheap and nasty hair jobs is a good warning – you’re right, better to pay out a bit more for a quality job than risk the damage. You and your hair (of course) should be in a saloon type of magazine.. Your hair is gorgeous! And Iove getting to know you more every time I read your blog! 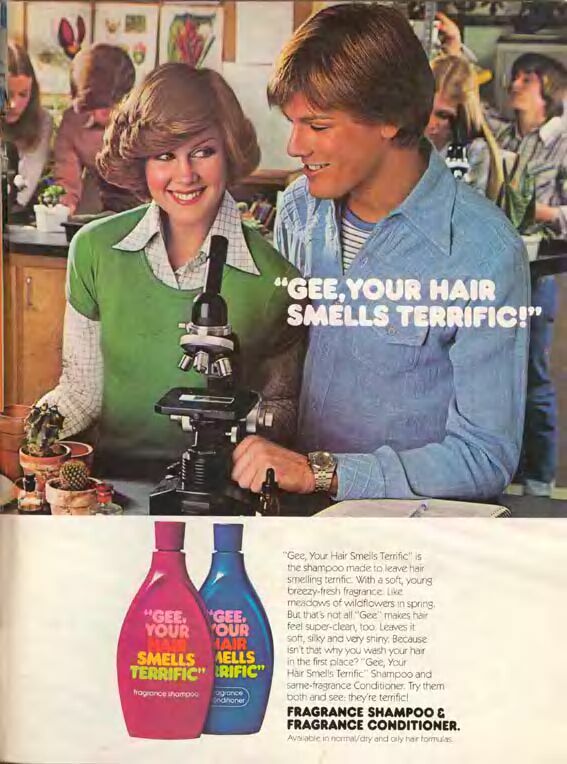 I LOVE “GEE YOUR HAIR SMELLS TERRIFIC”! I used to use that in high school… and I think it was cheap so my parents didn’t mind buying it for me! The marketing was that if your hair smelled “terrific” you would “get the guys”. LOL! I love marketing it never changes! Cheers! Sherry Jarwin recently posted..Thursday – Its a miracle! I love this week’s FBFF topic! I remember the commercials for the GYHST shampoo. I never would have guessed you had dark hair but I did wonder since I know you are of Lebanese descent. I also never would have guessed you have wild hair. It always looks great! mine on the other hand – if I let it dry naturally is a huge puffball of curly wavy frizzy!! Hi, Well put together post. Likely to issues with your web site within industry, may perhaps test out this particular? Firefox still is the market boss in addition to a huge a part of some others leaves out your wonderful publishing as a result challenge. This position is great from head to toe, literally. nose nostril open through the night better air flow. people feel energetic at the morning times because of rejuvenation. I guess I’ll jujst sum it up what I sbmitted and say, I’m thoroughly enjoying your blog. Do you have any helpful hins for inexperienced blog writers? I do agree with all of the ideas you have presented foor your post. Still, the posts arre too brief for novices. Could you please lengthen thhem a little from next time? of this website; this web site contains awesome and actually fine information in favor of visitors. some of the tantalizing transsexuals T-Girl Network features will do just about anything deliciously nasty that will get your giblets tingling. additional hints I became advisable this website by using my personal uncle. We are do not beneficial no matter if this post will be provided by way of him as who else recognize this sort of different regarding my problems. You will be wonderful! Thanks! recorded relies on its memory. There are lots of websites out there which detail the process. Here are 7 Budget Friendly Internet Marketing Tips. your marketing onn and training in there use. Another great tool for those wanting traffic is using social websites bot networking and bookmarking. can be pleasure. Which cell phone is better for you when it concerns the Droid vs iPhone debate? There may be no require to choose a ten inch an individual. Vitamins Symptoms of bone pain and muscle weakness can mean you have a vitamin D deficiency. My sister advised I may this way blog site. He or she had been solely suitable.. Vitamins Symptoms of bone pain and muscle weakness can mean you have a vitamin D deficiency. The following put up really designed my own time. A person can not imagine just that the lot occasion I had created spent with this facts! Thanks a lot!